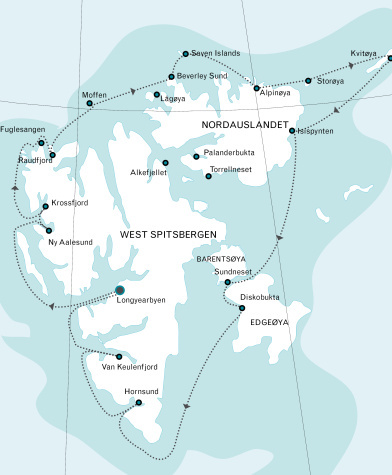 This cruise begins and ends in Longyearbyen, Spitsbergen. The expedition will explore the coastline of Spitsbergen encountering it's incredible wildlife, attempting to circumnavigate the island and also land at the rarely visited Kvitøya. The wildlife of Svalbard & Spitsbergen. Birds: Arctic tern, geese, Guillemot, Little Auk, Puffin, gulls (Kittiwake, Ivory, Sabine's & Ross's), skua, raptors (Sea Eeagle, Gyrfalcon & Peregrine). Whales: Humpback, Fin, Minke, Orca, Blue, Pilot, Narwhal, Beluga, Bowhead. Seals: Walrus, Hooded, Harp, Bearded, Ringed. Arrive in Longyearbyen, the administrative capital of the Spitsbergen archipelago of which West Spitsbergen is the largest island. Before embarking there is an opportunity to stroll around this former mining town, whose parish church and Polar Museum are well worth visiting. In the early evening the ship will sail out of Isfjorden. Heading north along the west coast, we arrive by morning in Krossfjorden, where we board the Zodiacs for a cruise along the sculpted front of the 14th of July Glacier. On the green slopes near the glacier, a colourful variety of flowers bloom, while large numbers of Kittiwake and Brünnich's Guillemot nest on the nearby cliffs. There is also a good chance of spotting Arctic Fox, who patrol the base of the cliffs in case a chick falls from its nest, and Bearded Seal, who cruise this fjord. In the afternoon we sail to Ny Ålesund, the world's most northerly settlement. Once a mining village - served by the world's most northerly railway, which can still be seen - Ny Ålesund is now a research centre. Close to the village is a breeding ground for Barnacle Goose, Pink-footed Goose and Arctic Tern. Visitors interested in the history of Arctic exploration will want to walk to the anchoring mast used by Amundsen and Nobile, in the airship Norge in 1926 and Nobile in the airship Italia in 1928, before their flights to the North Pole. We sail through Beverleysundet named by Parry in 1827 and also sailed by the Swedish-Russian Arc-of-Meridian Expedition in 1898. Today we will reach our northernmost point at Phippsøya, in the Seven Islands north of Nordaustlandet. Here we will be at 81 degrees north, just 540 miles from the geographic North Pole. Polar bears inhabit this region, along with ivory gulls. We push east to reach the area of Nordaustlandet, where the Nobile expedition drifted around in 1928 and where the Italian Sora tried to come to the rescue. There we hope to get to Alpinøya, reached by Sora in 1928, and then to the mouth of Finn Malmgrenfjord, and Albertinibukta and to climb Soraberget (205 M) from where we have a fantastic view on the ice-cap of Nordaustlandet. Alternatively we will land at Storøya, where again we may meet a group of Walrus. Today we hope to get to the rarely visited Kvitøya farthest to the east, close to the Russian territory. The island is dominated by an ice-cap, which leaves a small area bare of ice and snow. We will land at the western tip at Andréneset, where the Swedish explorer André and his companions perished in 1898. We will also try to get to Kraemerpynten in the east, where an enormous group of Walrus resides. South of Nordaustlandet we will try to land at Isispynten a Nunatak area surrounded by glaciers. Later we sail along the front of the Brasvell Glacier, the longest glacier front in Spitsbergen. In Olga Strait we have chances to spot the elusive Greenland Whale. In Freemansundet we plan to land at Sundneset on the island of Barentsøya to visit an old trapper's hut and then take a brisk walk across the tundra in search of Spitsbergen Reindeer and Barnacle Goose. Later we cruise south to Diskobukta on the west side of Edgeøya. After a Zodiac cruise through the shallow bay, we land on a beach littered with whale bones and tree trunks, which have drifted here from Siberia. We can also climb to the rim of a narrow gully which is inhabited by thousands of Kittiwake, together with Black Guillemot and piratical Glaucous Gull. During the breeding season, the base of the cliffs is patrolled by Arctic Fox and Polar Bear, searching for young birds that have fallen from the nesting ledges. We start the day quietly cruising the side fjords of the spectacular Hornsund area of southern Spitsbergen, enjoying the scenery of towering mountain peaks. Hornsundtind rises to 1,431m, while Bautaen shows why early Dutch explorers gave the name ‘Spitsbergen' - pointed mountains - to the island. There are also 14 magnificent glaciers in the area and very good chances of encounters with seals and Polar Bear. We may visit the Polish research station where the friendly staff will give us an insight into their research projects. Behind the station the mountains are home to thousands of pairs of nesting Little Auk. Today we land on Ahlstrandhalvøya at the mouth of Van Keulenfjorden. Here piles of Beluga skeletons (the Beluga is a small white whale), the remains of 19th century slaughter, are yet another reminder of the consequences of thoughtless exploitation. Fortunately, Beluga were not hunted to the edge of extinction and may still be seen locally. Indeed, there is a good chance that we will come across a pod. Cruising into Recherchefjorden during the afternoon we can explore an area of tundra at the head of the fjord where many reindeer feed. Return to Longyearbyen and disembark for the transfer to the airport and the flight to Oslo and home. Take a cruise on a classic Arctic adventure. Follow in the steps of explorers. Sail above the Arctic Circle searching out Polar Bears, whales and walruses. Explore the coastlines of Spitsbergen, Greenland and Newfoundland.